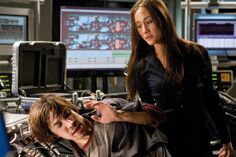 In Die Hard 4.0 Maggie Q is described by Bruce Willis’ John McClane character as ‘The Asian kid that kicks people.’ Although, Maggie Q has become the first chick to kick John McClane’s behind, and was recently seen battling it out with Tom Cruise and Philip Seymour Hoffman in Mission: Impossible III, there’s more to her than karate chops. ‘I’ve never looked at myself, in that way.’ It’s easy to see why. Maggie Denise Quigley was born and raised in Honolulu by her Vietnamese mother and American father. Feeling more Asian than American, aged 18 she decided to take a trip to Asia. ‘I felt like if I was going to make a move it would certainly be Asia. I never even thought of New York or LA. It wasn’t even in my scope.’ She took her backpack to Japan and China before a trip to Hong Kong changed her life when she was offered a modelling job and began working with singer Nicholas Tse on a series of commercials. A natural from the off, it was suggested she try her hand at acting. ‘It was another thing that just happened. I didn’t even embrace it until the third or fourth movie. I didn’t know that acting was what I liked and wanted to do. When you have no options and need to make money to go home, you’ll try anything.’ In all she spent nine years in Hong Kong and her performances in Model From Hell (2000) and Jackie Chan’s Gen-Y Cops (2000), soon had Hollywood agents calling. Die Hard 4.0 is out on general release on Wed 4 Jul. See Also Released.